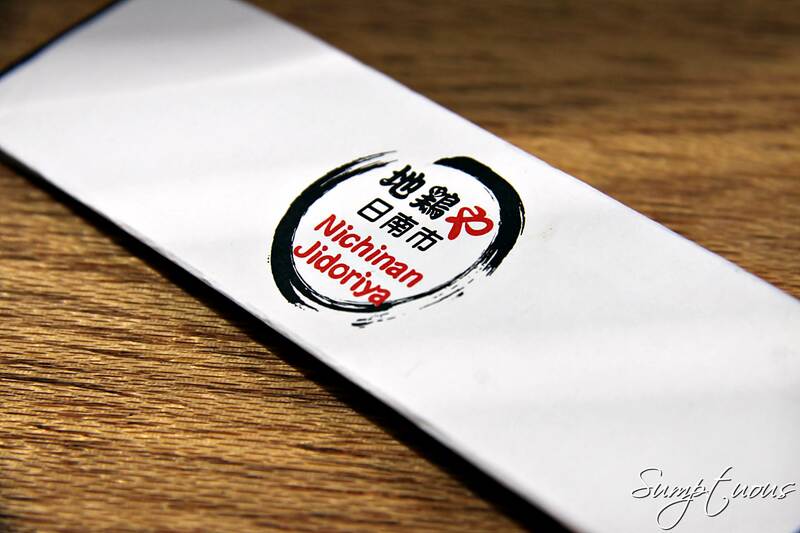 Our visit to Nichinan Jidoriya was more in view of a discount voucher at hand rather than a straight up decision to have Japanese cuisine for lunch. It was a quaint and delightful find, located next to Starbucks. 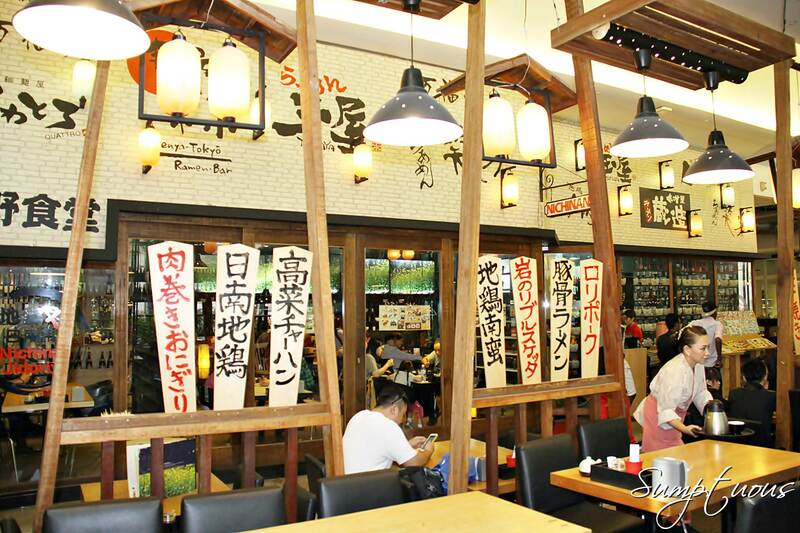 The menu at Nichinan Jidoriya is pretty comprehensive; with a wide range of affordable sushi, to sashimi, main courses and most of the essential Japanese food which you will expect to find in a Japanese restaurant. Arriving at around a quarter past one, the restaurant’s air-conditioned section was already crowded and the waitstaff showed us our table at the alfresco dining area. 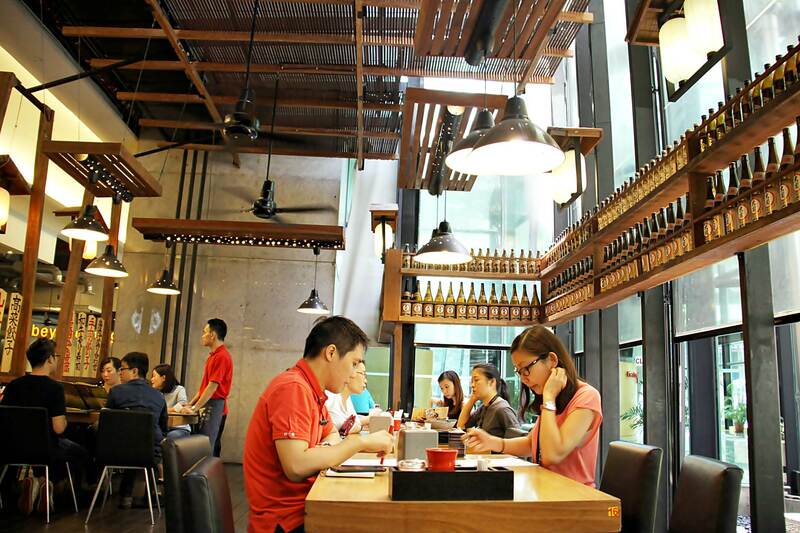 Not really an ideal choice to have lunch unless you enjoy the heat and smokers’ puffs! As I gathered everywhere would be the same, packed during lunch hours and my children were already hungry, I couldn’t subject them to another wait in another restaurant so we just took our seats and ordered away. Of course if possible, order their signature Miyazaki Jidori (which we didn’t), a free-range chicken originating in the Miyazaki prefecture, believing that the lack of growth hormones in the flesh makes a richer and chewier texture. Sashimi Set/刺身セット @ RM 25.00 ~ Fresh and thick slices of sashimi accompanied the set that came with a whole artillery of what could be defined as Japanese cuisine in a box. 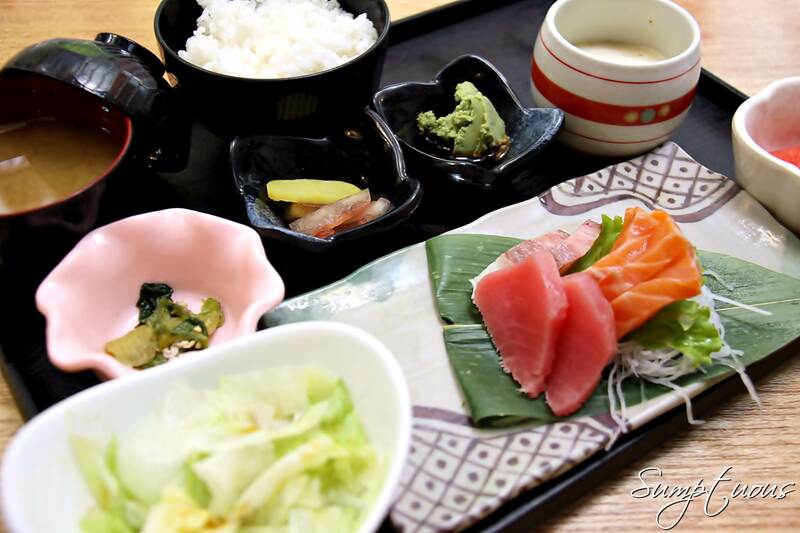 Sukiyaki Set/すき焼セット @ RM 23.00 ~ The Sukiyaki is also worth a try. Brimming with slices of Australian beef and vegetable lightly cooked in a sweet and flavourful broth; so hearty, it is something that I can eat all the time. Wagyu Saikoto and Garlic Rice Set/和牛サイコロとガーリックライスセット @ RM 25.00 ~ This was very well executed. The tender Australian beef was prepared just right and while the teriyaki sauce was rich, it didn’t overwhelm the meat. Well-marinated and nicely grilled together with loads of garlic, the meat tenderly melts in the mouth. Only one word to describe this — Yummy! Soft Shell Crab and Chicken Karaage Mini Burger /ソフトシェルクラブと唐揚げミニバーガー @ RM 19.00 ~ I personally feel burger is the trend now. 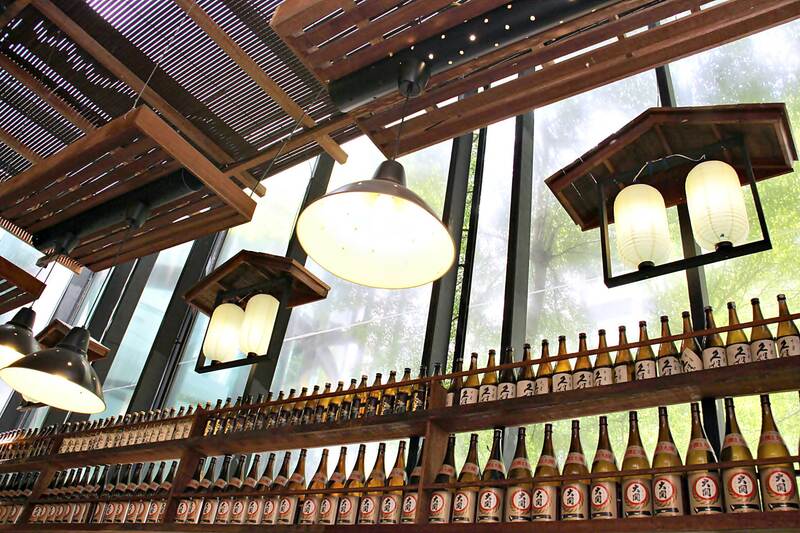 They have all sorts of specialized burger and even Japanese restaurants jumped onto the bandwagon. This burger with the soft shell crab had this firm and crisp texture which was tucked under the fluffy bun while the chicken karaage (deep fried chicken) was crispy, yet the inside was soft and moist. Clever use of mayonnaise helped to eliminate any oily taste from the deep fried stuffs. It wasn’t a lot of food, but we were actually pretty satisfied by this stage. Nonetheless, we decided to push our luck with the Sanshoku Bento anyway. Sanshoku Bento/三色弁当 @ RM 18.00 ~ Still, we gotta have some carbs; the healthier choice was the cold buckwheat soba …The chilled green tea noodle was also one of the better ones we’ve had so far. Ikura Chawanmushi/イクラ茶碗蒸し @ RM 18.00 ~ The burst-and-melt-in-the-mouth effect from ikura was totally priceless. Salty and with that mild briny aroma to satiate your palate’s craving and one is never enough. Highly addictive and goes so well with the smooth and piping hot chawan mushi. A must-order for Ikura lovers. At the end of the meal, we flagged the waitstaff, a foreigner and passed him our discount voucher. He seemed a little lost and I was a little worried so, I “highlighted” to him twice that the vouchers were printed on both front and back. We gave him a total of 3 vouchers and we knew we only had to top up about 20 bucks max for the meal we had. Five minutes later, the waiter returned and asked that I pay 60 bucks on top of the vouchers and I asked why? He explained that they accidentally keyed in only 2 discount vouchers and was told by his manager that it couldn’t be amended and asked me to use the remaining one on my next visit. Since it was clearly their mistake, I refused and asked for the manager. Soon, this guy Sunny Chia showed up with my vouchers and tried to explain the same thing, what was keyed in cannot be reversed blah blah blah… He was neither polite or apologetic to begin with, in fact, he was downright rude, arrogant and condescending. He even had the chic to revert the blame back to us, stating that we were “wrong” to print the vouchers on both sides of the paper. What a load of rubbish! (Honestly, I’m more than willing to pay the difference “IF’ the manager handled the issue professionally, afterall, I can still use the extra vouchers on my next visit). By now wifey was really upset and I got seriously pissed!! I said that I didn’t want explanations…their mistakes should not impact us, the paying customer. I politely, but in a stern voice told him to fxxx off and take the blame! This is not the first time I use discount vouchers, I reaffirmed, so don’t even try! The peril of this route, is that we tried, ended up unimpressed, and will never come back, not because the food is lousy but the attitude of the despicable manager that spoilt what would have been a happy and enjoyable outing. .. ..what a bummer! This entry was posted in Japanese, Mid Valley. Bookmark the permalink.